W. Brown Land Surveying, Inc.
W. Brown Land Surveying Inc. Serving the Twin Cities since 1983. Based in Bloomington, Minnesota, W. Brown Land Surveying has served the Twin Cities and surrounding area for more than 30 years. We use this experience and knowledge of the area to provide professional land surveying services to the people we serve. If you are in need of land surveying services, look no further. Our clients benefit from our service orientated work ethic and drive to get the job done right. Knowing where your property ends and where your neighbors begin is important to you and your next project. Looking at putting up a fence or a shed? Want to know where you property line is? We can help determine where your boundary is so you have confidence in your next project. We have experience in most municipalities in the Twin Cities. We know what you need surveyed and how to show that information in order for your project to go smoothly. With more regulations being enacted, surveys are becoming necessary to get the permits to complete the job. We do surveys that meet the ALTA/NSPS standards and can provide a ALTA/NSPS survey that is sometimes required for sales of properties. These surveys are very detailed and show all buildings, walks, driveways/parking lots, improvements, etc. We have experience in subdividing land including administrative lot splits, recorded plats, registered land surveys, and PLSS subdivision. When building a new home/building and/or doing a major renovation a site plan will effectively show how these changes will affect the property. When working on site plans we communicate with our client to layout and design the property to their needs. Getting your building in the correct spot is important, misplacement can be costly. With our precise equipment we can stake out your project so construction can start quickly and you have the confidence that things are in the right spot. 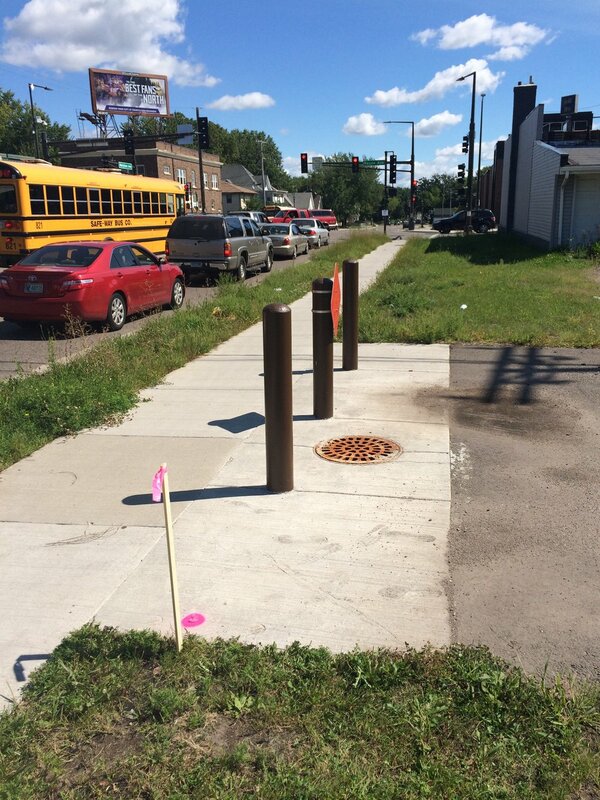 A survey marker in St. Paul for a vacant lot.